There is a lot of praise for Pinterest group boards. Some of it is a relic from older days and can be read with caution. But some of the praise is new. Even some (expensive) courses are building a strategy on the use of group boards. Yes, I have found success with group boards for a while, too. Until it all turned the wrong way. But there needs to be a serious and LOUD warning about group boards. Because the sad truth is that they have a tremendous power to hurt your Pinterest marketing success. And for the new Pinterest marketer, this group board flaw may be rather hard to find and understand. A group board on Pinterest is a board that has more than one contributor who pins to it. Group boars are initially created by a group board owner who sets the topic and the rules – and can add contributors to the board. If you want to become a contributor to a group board, check the description of the board, usually, it will tell you what you have to do to join the board. Let me make one thing clear up front: I am talking about on-topic group boards. So, let’s start with the benefits of group boards and why some people tell you that group boards are the answer to your Pinterest marketing struggle. This one is true. Especially when you are new to Pinterest. 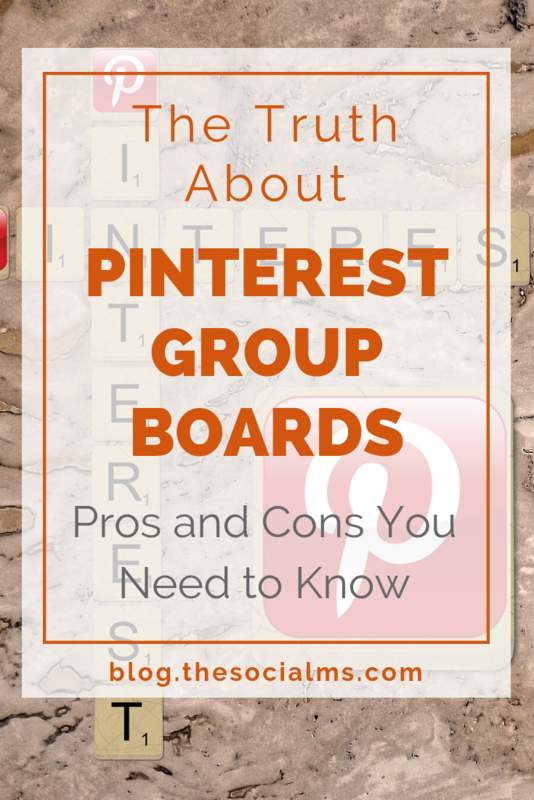 But don’t expect group boards to be the magic key to Pinterest success! Group boards come with a number of followers. When a group board is created it initially has all the followers that the creator of the board has on Pinterest. Once a group board exists, there can assemble a rather large group of Pinterest users as followers based on the pinning activity on the board. Assuming that the visibility of a pin on Pinterest largely depends on the followers a pinner or in this case a board has, a group board with a huge number of followers looks like a huge opportunity to gain visibility for your pins – even when you have just started out and have no followers on your account to speak off. An on-topic group board with active contributors will provide awesome pins of great variety on ONE topic. As a blogger, you can share all your blog posts to this board and the board will still have a ton of different pins. This variety will give Pinterest a good idea what the board is about and establish a relationship between your pins and the other pins on this board. This is an advantage for the listing and ranking of your pins. For your own Pinterest boards to achieve this diversity you would need to spend a considerable amount of time researching related pins that earn a ton of repins and pin these to your boards. Active boards are preferred to sleeping boards. A great group board will get a couple of new pins each day from various contributors. The above points make it seem as if group boards are all good. So why am I so strongly pointing to downsides of using Pinterest group boards for reaching Pinterest marketing success? The answer is simple. Because group boards can and will seriously hurt your marketing efforts. And you will have a hard time figuring out what is going wrong if you do not know how Pinterest works. Here is what happened when I tried to leverage the power of group boards. You can see how my reach increased based on getting accepted to and pinning to more (on topic) group boards. Our website traffic from Pinterest also increased at this time. But you can also see that that strategy was not paying off in the long run. So why was my reach so drastically decreasing while I did not change my Pinterest behavior? And what the heck have group boards to do with it? What do I mean by that? People pin to group boards, but they never repin anything from group boards. Yes, the group board rules often state that you have to repin from the board. But since nobody can check if you do, most people don’t. In reality, most group boards are just short of being a pile of spam. Your repin rate on group board pins will be abysmal. A group board strategy always includes pinning many pins to a couple of group boards – no not all of them at a time. But if you pin 3-5 pins to each of your group boards per day and have a couple of group boards – that are a lot of pins even if you still have a couple of own boards that you regularly pin your contents to. Since group boards will usually not give you repins, overall the number o repins you receive per pin will decrease – and the ranking of your account and pins on Pinterest will also decrease. … and so will your traffic from Pinterest. And even though you were promised to reach a larger audience through the group boards – and that worked for a while, eventually your reach will drop. The ranking of your pins and account gets so bad, that Pinterest starts showing your pins to fewer and fewer people because nobody seems to like your pins enough to repin it. That is what may happen if you use group boards – it does not have to be like that. There are still very active group boards that are run like a community and will give you many repins. But you have to be careful which group boards you choose. Some niches are more active than others. I am active in the marketing niche, and I have to admit that we marketers are probably the worst type of social media users. We look for a strategy to game the social platform and once we found a strategy we try to scale without scaling the time investment we have to make. That is what is killing strategies like group boards. Because marketers trying to game Pinterest heard that group boards are a good idea and simply overdid it until the strategy died – in the marketing and blogging niche. For travel, recipes, DIY or something else where many people just collect ideas, the strategy may not be as dead as in the marketing and blogging niche. So, how can you figure out if a group board is active and gets repins? Whatever you do, you will probably have to join the group board first, see how it works out and leave it is not working for you. The best way I know to check the activity – and the impact on your pins – is the analytics section of Tailwind. That is a good start. But you need to consider the average number of repins with care. The stats look far back into the past. The activity of a board can tremendously change over time. What used to be an awesome board with thousands of repins can be almost dead, today. And in the end, what you really care about is how YOUR pins are doing on the group board. Let the others struggle as long as your pins get repins everything is fine. Tailwind also gives you a list of your best-performing pins – you can filter this list by each board that you are a member of. This way you can see if your pins on a certain group board have earned any repins at all – and base your decision to leave or keep a group board on this. Whatever you decide to do with group boards, just keep in mind that every silver bullet comes with a secret risk. And group boards are no exception. Jumping on the group board train without being aware of the risks can kill all your Pinterest marketing success!